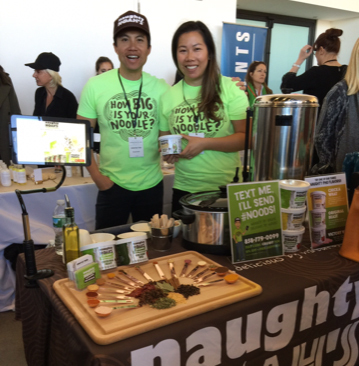 "Texas-based Naughty Noah’s launched its line of vegan pho in September and is already planning an expansion of its product line this month. The company targets the consumer seeking both health and convenience, and currently offers three flavors of its pho—Original Beast, Chicka What and Victory Veg. We spoke with JimmyTay Trinh, who founded the company with his sister Jenny Hoang, about the company’s trajectory and what it takes to bring new flavors to the American consumer. What’s the idea behind Naughty Noah’s, and why start with noodles? JimmyTay Trinh: I was born in Vietnam. We came to America as an immigrant family that had nothing. My mother was a self-made entrepreneur. In 2007, I was 180 lbs at 5’7”, but I was able to drop to 150 with very little exercise. What I realized was that I needed to incorporate the traditional background and cuisine of my culture—Vietnamese cuisine—into my palate more than the American diet. I realized that diet could change everything. I’d gone to culinary school in New York, and my mom opened a Vietnamese pho restaurant. We were doing Vietnamese pho noodles, which is authentic to us, and we were seeing the health benefits of eating Vietnamese food. After we found out we were pregnant with our son Noah, I was looking at the noodle space and said, “How come no one’s doing anything authentic in this space?” I’ve had my stint of ramen noodles. So I started researching the brand, and said, well now that Americans are catching onto pho and Vietnamese food, we’re going to start off with this line of products. It was three years in the making and we launched at Expo West. It’s authentic to us. We’re not Vietnamese people trying to do Mexican cuisine. That’s the goal for us, we’re building a legacy for my family, for our culture, and for the world—the world would be a better place if Vietnamese food were more a part of it. Do you have any plans to expand your product line? JT: We’ve been looking at other categories. We’re looking at spices right now and another line of noodles; we’re looking at either seaweed or some other type of natural, sustainable ingredient that’s not wheat. We’re also looking at teas or coffees. We’re looking at different categories and seeing what would be the best streamlined product that’s authentic to us and that would really refresh that category. We’re in conversations right now with a research and development group to figure out what the next best use is of Vietnamese cuisine that we want to bring to this space—is it beverages, is it ready-to-eat foods?Which aisle do we want to tackle next? Your products are vegan, but pho is not traditionally even vegetarian. Can you talk about how you bridge authenticity with the dietary preferences that drive market demand? JT: It’s my mother’s recipe—we just adapted it to the American palate. It’s authentic in that the spices we utilize in my mom’s restaurant are the spices in our package, and the rice noodles too. To give it a more modern taste and texture and feel, we put in avocado oil. We use avocado oil as a healthy fat to give it that modern kind of flair; we went through a couple iterations and the avocado oil really sits well with our product. My mother serves beef bones, but vegan is kind of the future in some ways. So we said, how can we take a traditional recipe that relies heavily on bone broth, modernize it to the American palate and make it sustainable. I wanted to put something there as a base foundation and leave it up to the consumer if they want to add other proteins or vegetables. Being a vegetarian or vegan is an option, but not a must—it’s up to you. What gives Naughty Noah’s that traditional beef flavor in your mom’s recipe? JT: I can only say it’s a vegan beef flavor—what’s in it is proprietary. What does your mom think of the recipe? JT: At first she was like, what the heck are you doing? But she’s tasted it and she likes it. It really is her recipe. Are there any lessons you would share with young entrepreneurs or businesses looking to bring new types of cuisine to the American market? JT: One of the key things I would share is patience is super critical. As far as flavor profile, just be 100 percent authentic, and look at what’s in the space currently and how can you bring it to another level."